Residents in Dillon are sure to notice a gaping hole along Lake Dillon Drive where Adriano’s Bistro once stood. Only rubble and a suddenly out-of-place sign remain of the long-standing restaurant, bringing bittersweet emotions to the forefront for the Ottoborgo family, who has owned the property since the late 1980s. But as one business falls, another emerges. Soon visitors to downtown Dillon will begin seeing the skeleton of a new structure rise from the debris, signaling the emergence of Uptown 240, a new luxury condominium complex meant to provide a more modern living experience and to help address the area’s workforce housing concerns. Uptown 240 is an upcoming 80-unit luxury condo complex set in the heart of Dillon, next to the coming Hilton Homewood Suites. The structure will be complete with a 5,000 square foot restaurant, yet to be named, in addition to a 6,000 square foot amenities deck featuring hot tubs, fire pits, a community room and covered lounging areas. The complex will also include a full 2,500 square foot gym. The complex will offer studio units along with one, two and three bedroom units with prices ranging from as little as $275,000 to more than $1 million. The facility also has an underground parking lot equipped to host 100 percent of residential parking on site, as well as 95 percent of parking for commercial visitors. 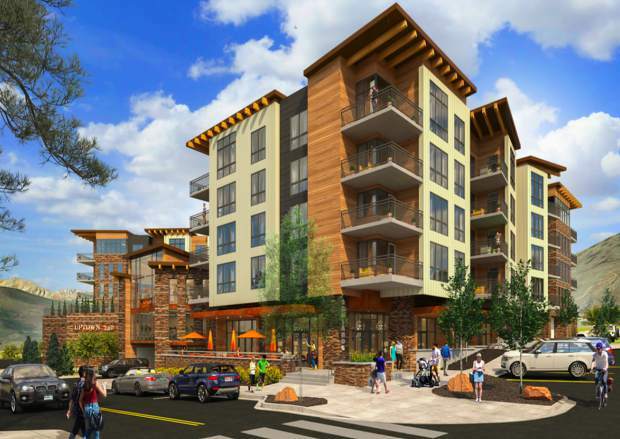 On the outside the building will feature an upscale “mountain modern” design developed by Studio PBA out of Denver, looking to subtlety break the mold of more traditional mountain architecture. Though units are yet to hit the market for pre-sale, Greve noted that more than 70 individuals have already shown interest in making purchases, and more are calling in every day. But the first dibs will go to members of the workforce. As part of the project, Uptown 240 will be offering nine units of affordable workforce housing for permanent residents who work for at least 30 hours a week in Summit County. But unlike most workforce housing units for purchase in the area there are no area median income restrictions, or any appreciation caps. Greve and the Ottoborgos are already receiving offers for the nine workforce housing units. Greve said that pre-sale options for those already on the waiting list will likely open this weekend, and for the general public the following week. Construction on the complex will begin this fall, and is expected to be complete by mid-summer 2020. The Ottoborgos moved to Dillon in 1987, where Ivano and his father Alex opened the Ristorante Al Lago, later reopened under the name Adriano’s Bistro & Deli in late 2010. But the property is more than a restaurant for the family. For years it was their home, where Ivano and his wife Gina raised their children in an apartment beneath the restaurant. So when designing the new complex, family was on the top of the list. Uptown 240 will embrace that philosophy, heavily involving the entire family — Gina, Danilo, Adriano and Chantelle — in different roles in the business.